we have taken the difficult decision to cancel Vélo South. On Sunday September 23, 2018, 15,000 cyclists will start a major new 100 mile closed road amateur cycle event from Goodwood Motor Circuit and will take a route that effectively circumscribes Easebourne Parish and routes out of the parish will be closed for large amounts of time during the day. Please see the route map below, on which are annotated road closure times. Due to the scale and numbers participating in Velo South, it will be necessary to implement road closures across the full route to facilitate the safe passage of cyclists. The route has been carefully considered and selected through a partnership of all local authorities above Parish level, emergency services and transport operators to minimise the inconvenience of the necessary road closures. Emergency Services will be operating as usual and the public should use normal protocol in the case of an emergency. Velo South will do it we can to provide Easebourne Parish Council with more information on how parishioners can best navigate around the road closures. 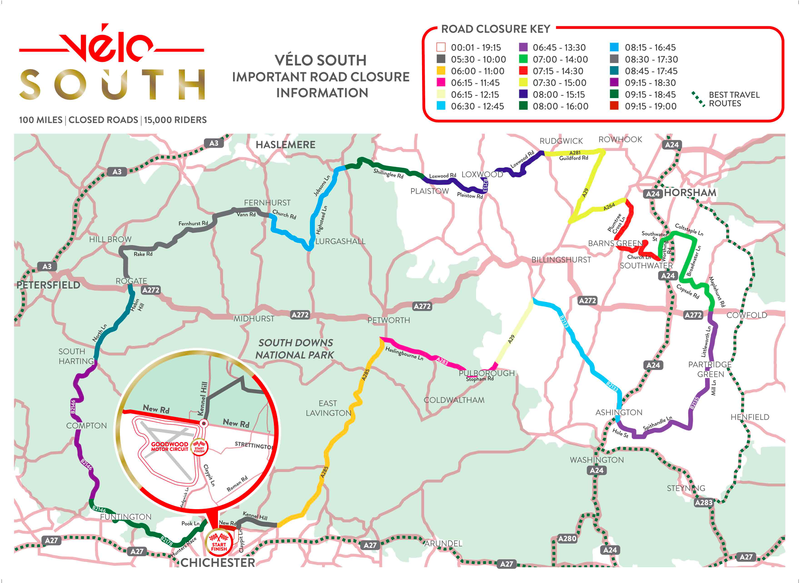 All Velo South road closure information will be shared with travel information services and satellite navigation providers and this page will be updated with detailed road closure and access maps to support local community access as the event approaches. This will be a magnificent event to go and watch – viewing points will be advised later, on the Velo South website, but note that the ride will be passing through Fernhurst Town Centre which could be a great spot to watch from, although parking availability in this area may be problematical. The Velo South website contains much information and will be continuously updated. The Parish Council strongly suggest you visit the Velo South website prior to making any travel plans for 23 September.